On Saturday 11th November 2017, GoBike members Bob Downie and Andy Winter, and Rumina Kakati (who leads rides enjoyed by new, nervous and lapsed cyclists) met with Allan Young, the Green councillor for Govan ward, to go on a tour of some of the cycle facilities in the ward. Committee member Brenda Lillicrap organised the ride but was prevented from doing all but the start of the tour by a puncture. We were delighted that Allan was available to come out with us and hope that the other three ward councillors will be able to come for a similar tour in future. The invitation remains open . Our route took us out and back from Cessnock subway station, past Bell’s Bridge, the Science Centre, Queen Elizabeth University Hospital and Govan centre, all the while critiquing the cycle facilities we saw and used, good and bad. Our start was in Walmer Crescent, a short one-way street with slow traffic, no junctions, and a sharp corner at both ends – ideal for the council’s declared default of permitting contraflow cycling on one-way streets. Not yet though. 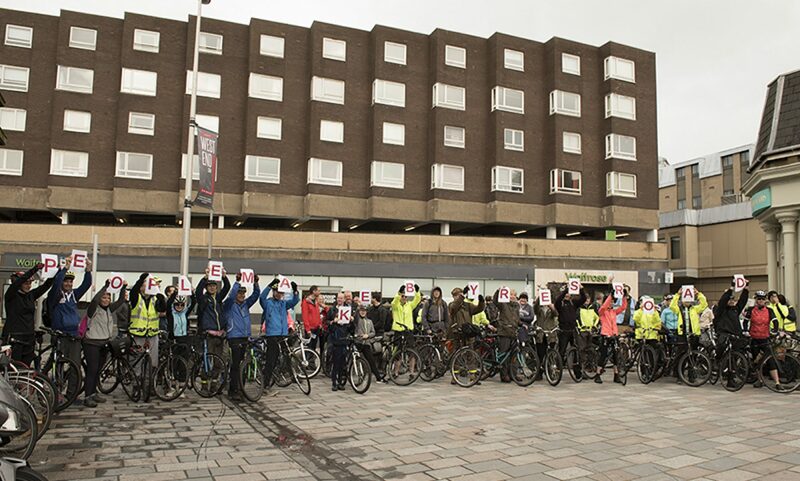 Our route initially took us north on the signed Cycle Route 7 along Cessnock Street, Brand Street – now with perpendicular parking for the new flats along the south side, a potential hazard for cyclists on this well-used route – and Govan Road. We able to see the ‘improvements’ being made connected with Fastlink. We wondered about the value of spending money on a grade-separated cycleway alongside a road where the only permitted traffic is buses and taxis – and there aren’t any bus routes. There are much stronger candidate areas for cycle infrastructure spending even when the funding is ring-fenced for work connected with Fastlink. Our first major hurdle was where Govan Road joins Pacific Drive. At these traffic lights, cyclists are invited to behave like pedestrians and cross Pacific Drive to cycle westward on the north-side pavement. To cross, cyclists must wait for 3 individual sets of pedestrian controlled lights, the first to cross the two lanes of the Fastlink bus corridor (not available for cycle use), followed by lights for each lane of ordinary traffic. The presence of extensive pedestrian barriers makes crossing by more than 2-3 bikes at a time very difficult. The experienced cyclists will almost certainly ignore the invitation to use this crossing and travel westward on the road. Those new to cycling (or with tandems, trailers or cargo bikes) are discouraged by tight turns made more difficult by poles, railings and control boxes, especially when there are pedestrians or other cyclists to consider. While manoeuvring the crossing we agreed that plans to designate the footway on the south side for shared use (right through the bus shelter, and next to the sparsely used Fastlink carriageway) were a frustratingly marginal improvement, and we wondered why no effort had been made to route cyclists behind the Village Hotel to get toward’s Bells Bridge. There is already a crossing across Pacific Drive opposite the Bell’s Bridge path, albeit one offset from the desire line and with yet more barrier/pole/box obstacles. It was generally agreed that the new path from Pacific Drive to Bell’s Bridge then continuing along the river in front of the BBC and the Science Centre was excellent. We wished it were possible for the riverside path to extend eastwards under the Clyde Arc Bridge. Back at Govan Road we continued westward and on to Golspie Street, which was re-engineered to accommodate the Fastlink carriageway. This gives it the appearance of a fast dual-carriageway, by-pass type of road, with its absence of active frontages and sweeping turns at the junctions. With the two directions of normal traffic using the single non-Fastlink carriageway it feels like a hostile piece of road for cyclists. This section is difficult to avoid for east-west travel because of the barrier of the lines into the subway depot. The layout of the both junctions on this stretch encourages drivers to make fast left turns, with the potential for left-hooking cyclists. The extensive pedestrian barriers at the junction with Harmony Row hem cyclists in in a manner that is worrying. There is nowhere for cyclists to escape if cars come too near. A newish, good quality pedestrian-cycle route took us the 200m from Golspie Street to Langlands Road. This was free of motor traffic and wide enough for cyclists and pedestrian to easily pass in both directions. A useful improvement would be a dropped kerb at the eastern end to allow easy access for west-bound cyclists without having to mingle with pedestrians at the pelican crossing. On Langlands Road significant sections of the advisory cycle lanes, only denoted by painted lines, were blocked by parked cars on both sides of the road. We understand these painted lanes form part of the ‘active travel access’ for the newly enlarged hospital. Allowing parking in cycle lanes shows that cyclists lack any real status on Glasgow’s roads. Cycle users deserve better. We carried on along Langlands Road to the underpass beneath the A739, the busy dual carriageway leading to the Clyde Tunnel. This underpass gives cycle access to the Queen Elizabeth University Hospital, but the large amount of graffiti and general feel of dilapidation gives it an edgy feel. This is not a facility most people would like to use at night. The feeling of dilapidation continued on the west side of the A739 where the first entrance to the hospital had no dropped kerb as well as being very rough, and needing another tight turn to negotiate the bollards in the underpass entrance. We continued north beside the A739 on an excellent shared pedestrian/cycle path which continued along Moss Road. At the junction with Peninver Drive a new pedestrian/cycle crossing has been installed but the timing of the lights was so slow (about 3 minutes) that no one was inclined to wait and we all took the chance to cross when the traffic appeared clear. The timing of these lights needs to be reviewed. Onward to Govan Road where we noted that parking was allowed by the shops near the junction with Holmfauldhead Place. We were told that this parking can at times cause significant congestion leading to cyclists being squeezed on the road, with drivers overtaking without allowing sufficient space. A major problem in this area is the difficulty that south-going cyclists have turning west along Govan Road when they exit the Clyde Cycle Tunnel. To cross Govan Road “by the book” is so slow and complex that few cyclists comply and simply cross Govan Road when and where they can. The lack of a simple and safe crossing is simply unacceptable. Our tour concluded with a ride through the centre of Govan and discussion as to how a dedicated cycle route through the main street of Govan Road could be a significant feature as part of the area regeneration. Overall we were underwhelmed by the cycle facilities that we saw and used in Govan. Short sections were excellent but on the whole we felt that most were let down by poor design and poor implementation. The biggest issues are the lack of interconnectivity between adequate facilities and the method the planners use to take cyclists across main roads by requiring cyclists to behave like pedestrians and use complex, slow, barriered crossings. These are tricky for inexperienced cyclists to manoeuvre through, and experienced cyclists are likely to ignore the lights and cross as and when they see a gap in the traffic. The perennial problem of cars parking in non-segregated cycle lanes remains an issue in Govan as almost everywhere else in the UK. We hope that Councillor Allan Young will be able to use the information gained in this tour to inform him in his work as a councillor and as ever, GoBike are here to help should he (or any of the other three Govan councillors) have any further questions. We have one more tour planned for Friday 01 December with Councillors Cullen and Cunningham around Ward 13, Garscadden/Scotstounhill. Then, unless we can choose daylight during the winter, we’ll be hoping to resume in the spring – if councillors are minded to join us! Glasgow’s Fastlink – why are there “cycle upgrades” off the route? GoBike member, Johnston Orr, trying to cycle along the Colleges Cycle route on Highburgh Road towards Byres Road. Note the car encroaching on the very narrow door opening zone and the car parked right across the bike lane! On Saturday 23 September, GoBike convenor, Tricia Fort, and Johnston Orr met one of Partick East/Kelvindale’s 4 councillors, Tony Curtis, Conservative, for a short tour of the ward – but lots of discussion. Tony is very keen that all road users obey the Highway Code and relevant legislation, behave responsibly and respect each other, follow guidance when it comes to staying safe on a bike and he is keen to get Police Scotland to address parking and speeding infringements. The possibility of a cycle link from the western end of Devonshire Terrace through to the front of bar/restaurant1051GWR; this would allow people to cycle from Devonshire Terrace along the existing footway, if it were cleared of vegetation and widened, to access Hughenden Lane or Shelley Road. The reduced hours of operation of the bus lanes on Great Western Road and the lack of any cycle infrastructure on this major artery into the city centre. Hyndland Road from Great Western Road to the top of Clarence Drive; this is a main route, as Tony pointed out, and yet there is no cycle infrastructure. The poor condition of many roads, and many cycle lanes, in the city, and in this ward. The positioning of the cycle lanes on Hyndland/Highburgh Road from Clarence Drive: currently the cycle lanes are on the outside of parking bays. The door opening zone is too narrow, only 0.5m rather than a realistic 1.0m, and many cars were poorly parked, encroaching on the narrow door opening zone. Irresponsible parking, such as right across the cycle lane. The apparent contradiction between Glasgow City Council’s policy and action on one-way streets, particularly those streets that are changed from two-way to one-way ostensibly to allow parking on both sides, with respect to maintaining access for people to cycle. The references here are: Glasgow City Council’s Strategic Plan for Cycling, page 28 referencing their use of Transport Scotland’s design guide, Cycling by Design which states in section 5.1.5 on page 52, under Contra-flow Cycle Lanes, that “The default position should be to permit two-way cycling on one-way streets.” This is very pertinent for areas such as Dowanhill, where two-way streets have been made one-way under new parking regulations, and for Partick, where new parking regulations – and new one-way streets – are about to be introduced. This means some significant detours for people who wish to cycle. GoBike’s view is that cycle infrastructure should be provided where people cycle and our analysis of Strava and other cycle-counting data is here on our website. Great Western Road, as a main artery into the city centre, has significant numbers of people cycling along it, as does Byres Road, on the edge of this ward, but neither has any cycle infrastructure. Partick East/Kelvindale is currently the home of the most cycle-interested councillors in the city. All four councillors have responded to our invitation to walk or cycle round their ward! There has been a nil response from many other wards.